My subject for the 2016 PSS mass build of the A-4 Skyhawk is the A-4SU variant used by the RSAF. As well as a mainstream RSAF service aircraft, it was used during the 1990s in a team of six A-4SUs by the RSAF Black Knights aerobatic display team, in the national Singapore colours of white and red. The A-4SU was based on the A-4C, and will require a slightly shorter nose and more upright air intakes than the A-4E shown on the plan. Other differences may come to light as I progress. I don't intend to present a full blog, as time is rather short to get it finished. I shall concentrate on the building and post anything interesting that I haven't seen in other blogs. Best wishes, Steve! What a gorgeous colour scheme, too. Good to see you underway with the A-4 Steve, and a great choice of scheme! Enjoy the build!! 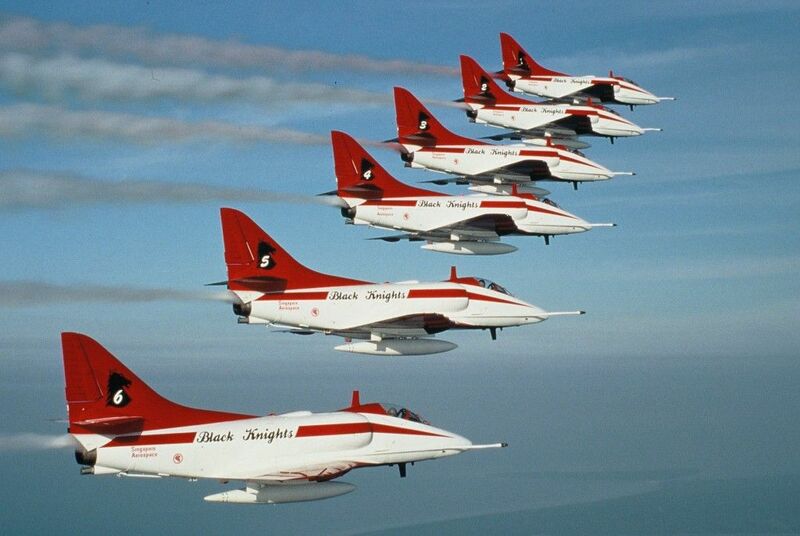 Since I started this thread I noticed that you have also posted pics of the Black Knights on Graham Gilliver's thread. Great minds think alike! I hope one or two others may follow the same Black Knights scheme, so that we can give those Blue Angel builders an aerobatic team challenge! Phil, I'm glad to be on the job at last. I hoped the Zlin 526 ASM would be finished for this weekend on the Orme, but I didn't quite make it. I will now leave the Zlin until I have made significant progress on the A-4. 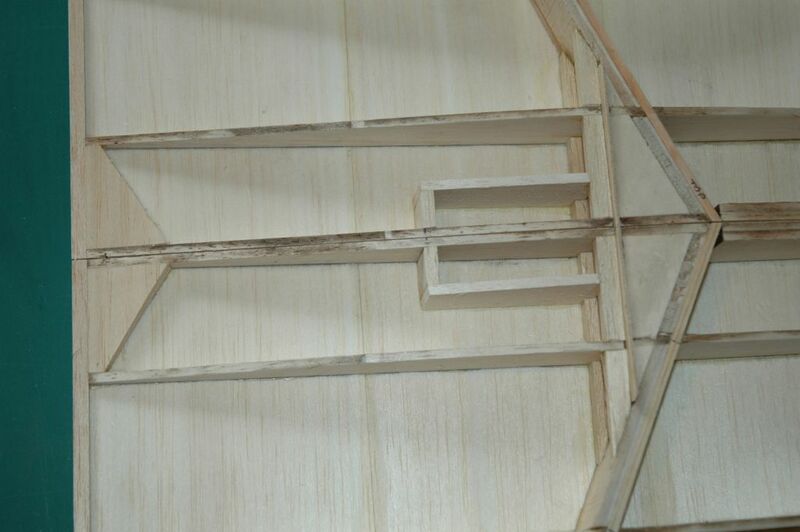 I have started on the wing, and haven't seen much information about this on the other threads yet. 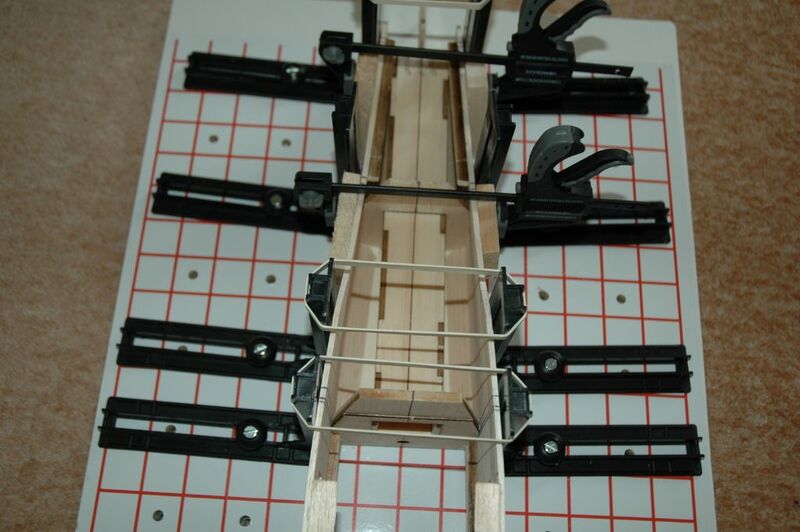 The ribs, spars, webs are glued down to the lower sheet. 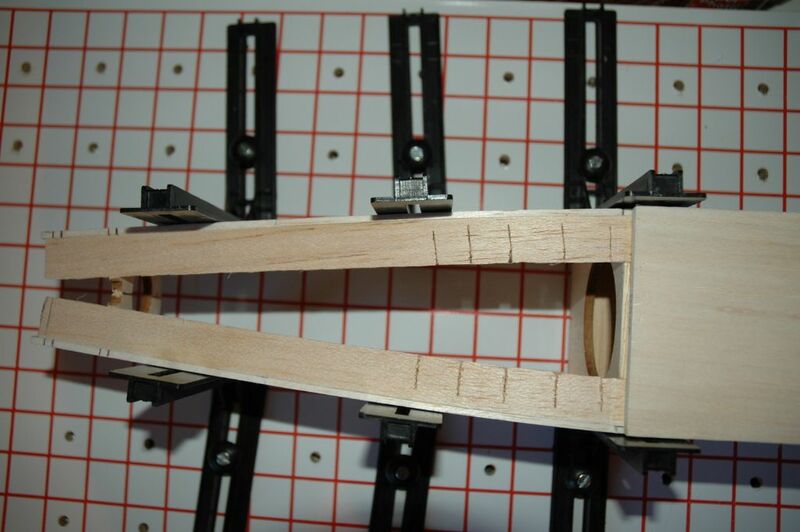 I'm puzzling how to shape and attach the sub-LE 1/8" sheet without having access to plane it after glueing in place, as it will be tucked under the lower sheet. I think I shall pre-chamfer the bottom edge, and hope it is somewhere near to the right angle, and stuck in the correct alignment with the bottom of the ribs, when I roll the lower sheet onto it afterwards. 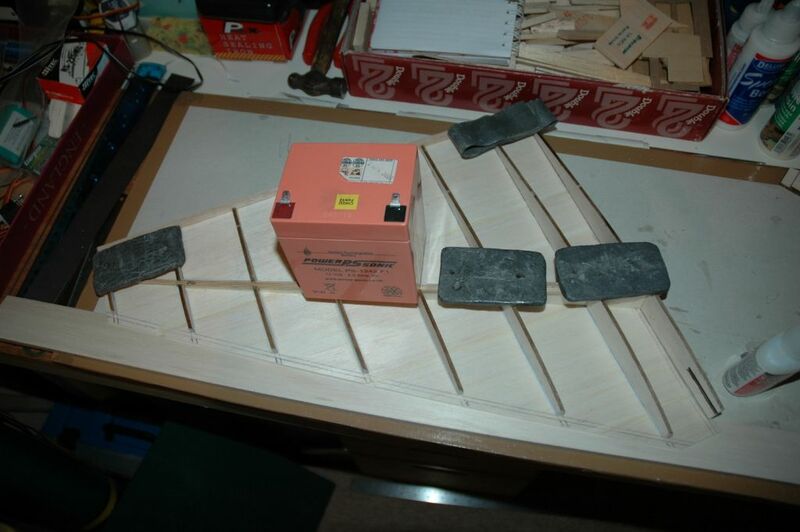 I did wonder about wrapping and gluing the lower sheet onto the ribs first, then add the sub-LE, but the structure would be a little flexible and I might add twists. Good question Steve, you can do it either way I think... 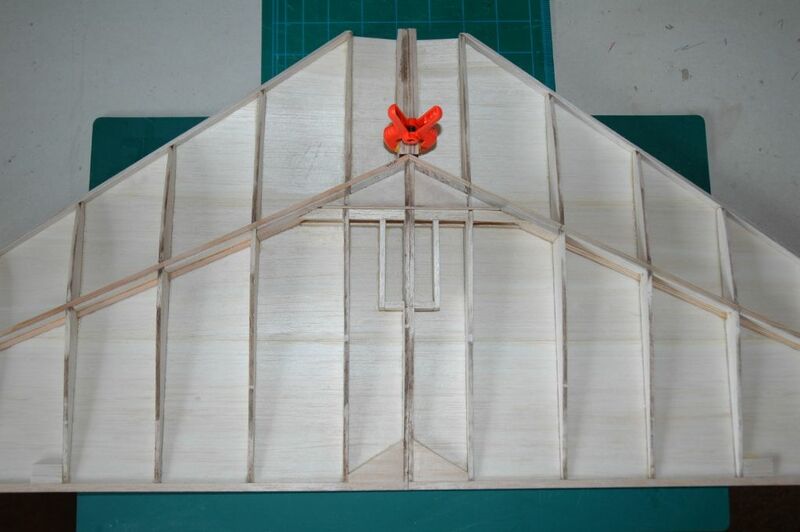 I will have to re-read my build article but I would suggest its easier to roll the bottom sheeting up first THEN add the sub L/E into the resultant 'corner' groove. 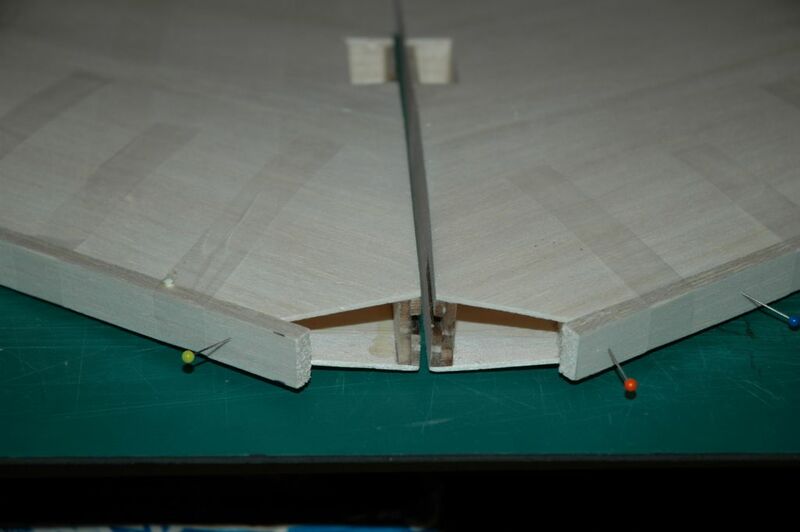 Ribs are aligned fine and glued to the bottom sheeting with the bottom spar and the rear sub T/E and once that's dry you would be able to add the top spar and cross spar webbing - adding further stiffness. 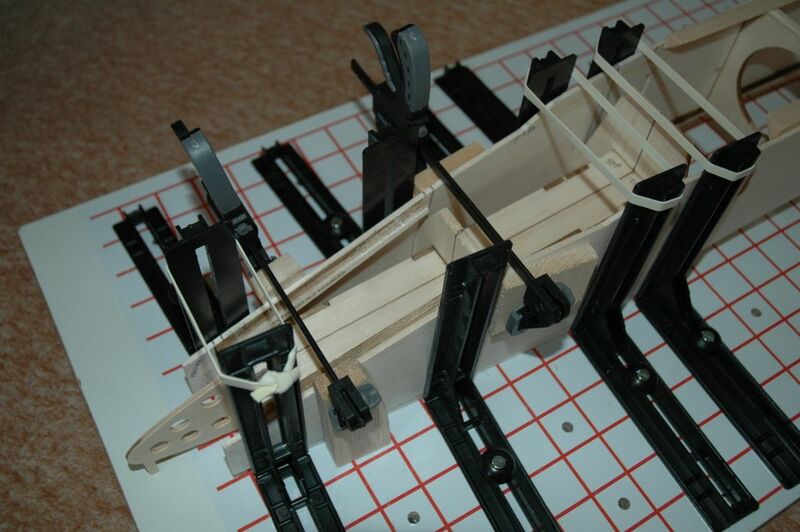 Then you can roll the L/E sheeting up onto the underside of the ribs prior to adding the sub LE. 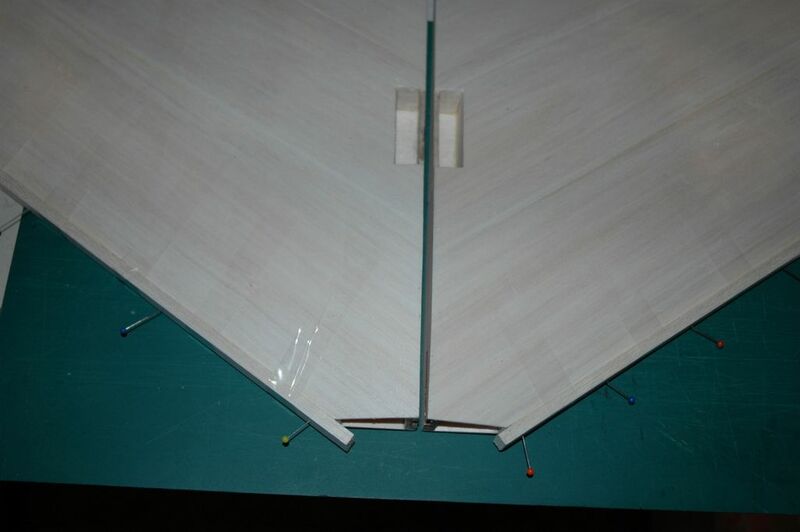 I would try to keep the wing pinned down and chock up the skins where needed at the front using a section of thin elevator stock positioned at the right angle to give the varying degrees of elevation needed along the span root to tip. You can chamfer the bottom edge of the sub L/E to achieve an almost perfect fit if you wish but the amount of curvature on the underside of he ribs is fairly limited and the resultant gap if it was left square would likely be much smaller than the bead of PVA used to retain in in the groove. Thanks for the ideas, Phil. 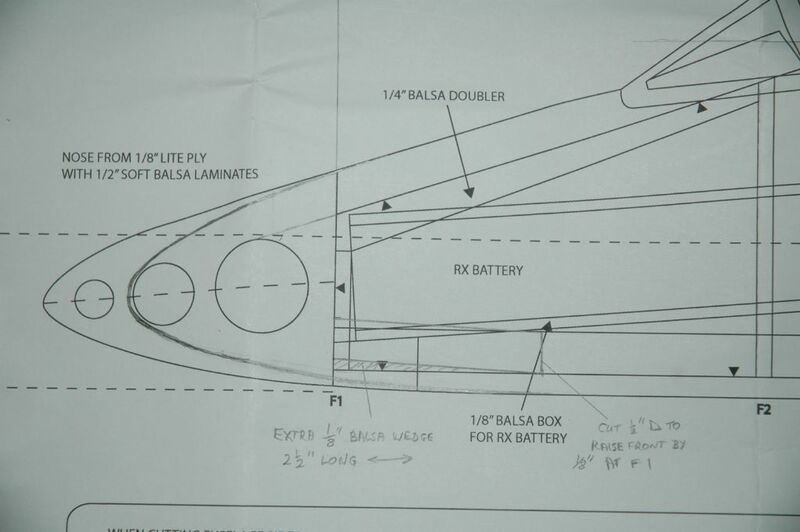 The magazine article (presumably from Matt's notes) suggests glueing the sub-LE before lifting the TE of the wing to roll the sheet onto the bottom, but I couldn't see how to attach the sub-LE correctly using that method. I may try the sheet first technique. 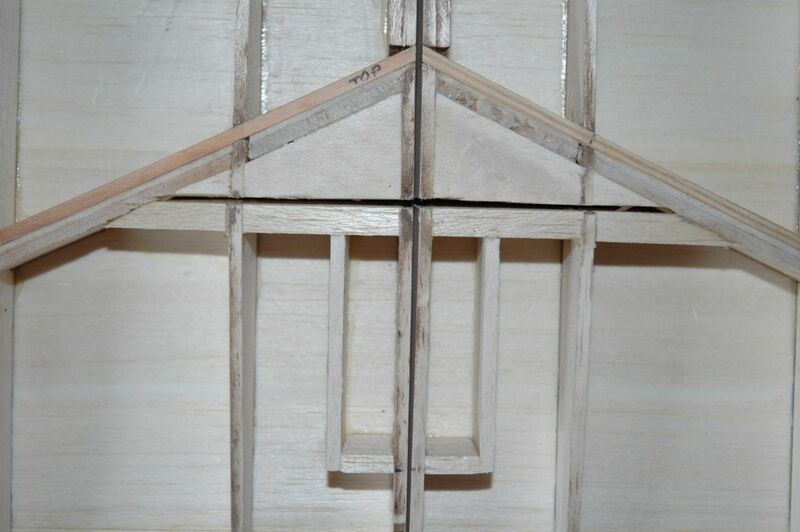 I've just added the 1/8" webs to the two centre rib bays, and when dry I shall study form to decide on the best approach. 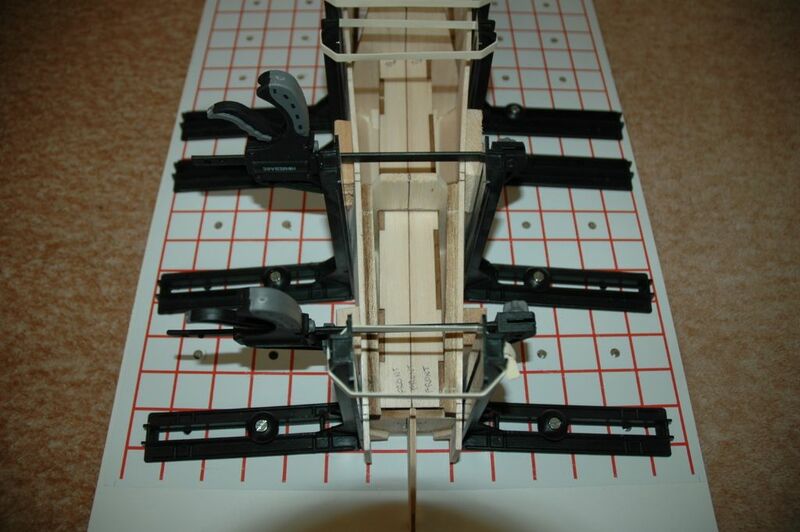 I adopted Phil's suggestion for the lower sheet and sub-LE, and left the wing flat on the board, with the lower LE sheet packed up with a piece of TE stock. The tip needs very little packing, and the root needs much more, so the packing is angled. I've finally found a use for a bottle of Super Phatic that I bought last year. 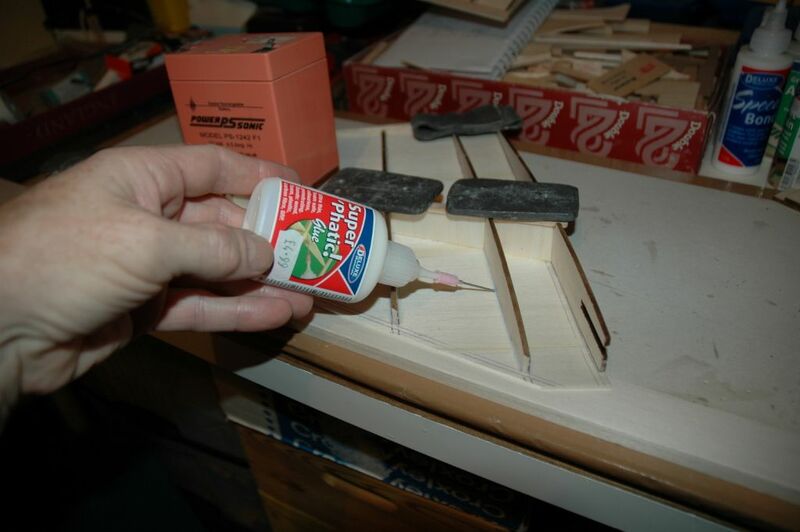 Instead of squeezing aliphatic into the gap between the ribs and the sheet, just apply the super-penetrating glue once everything is held in place and let capillary action do the rest. I suppose some techies would use super glue, but I never get on with it, preferring the sticky white stuff. 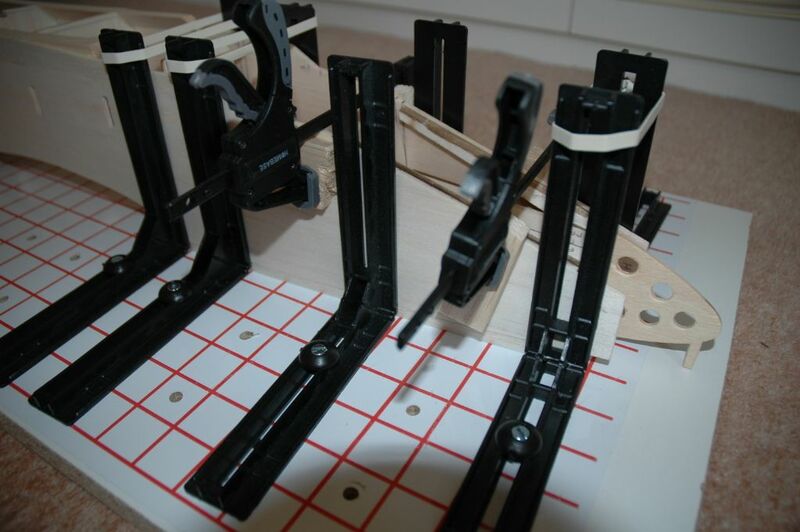 R1 will have to be glued later, as it needs an altogether different packing angle. I haven't fitted R1A yet, preferring to wait until the sheet has been stuck to the ribs. While the ribs dry, the sub-LE can finally be added. I did chamfer the lower edge slightly, but it needs less than 1mm, so a gentle application of the sanding block was sufficient. Real aliphatic used for this. Great job Steve - your photos help describe the method perfectly and it looks like that's worked well - the use of T/E stock as packing with variable amounts via the angle change from root to tip is well shown in your photos and will prove valuable to others I'm convinced! Glad its gone together quick and in a straightforward manner. Thanks Steve, I will use that. The simple ideas are often the best. 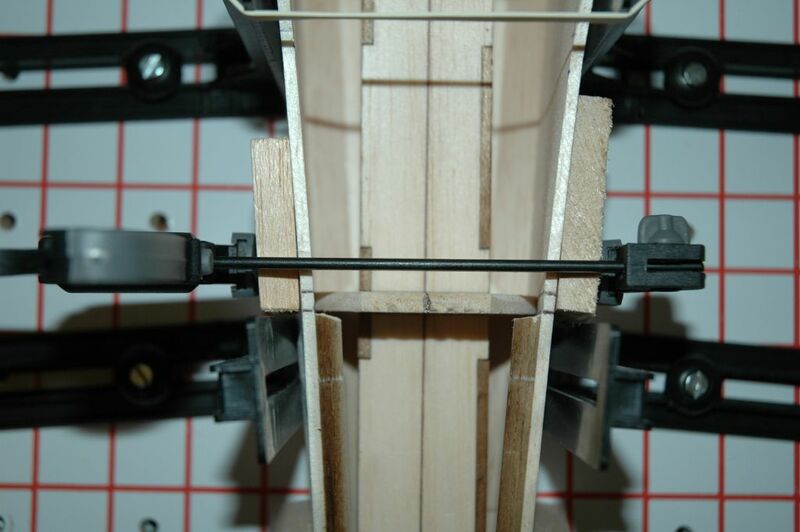 Here are a few photos of my centre section bracing. 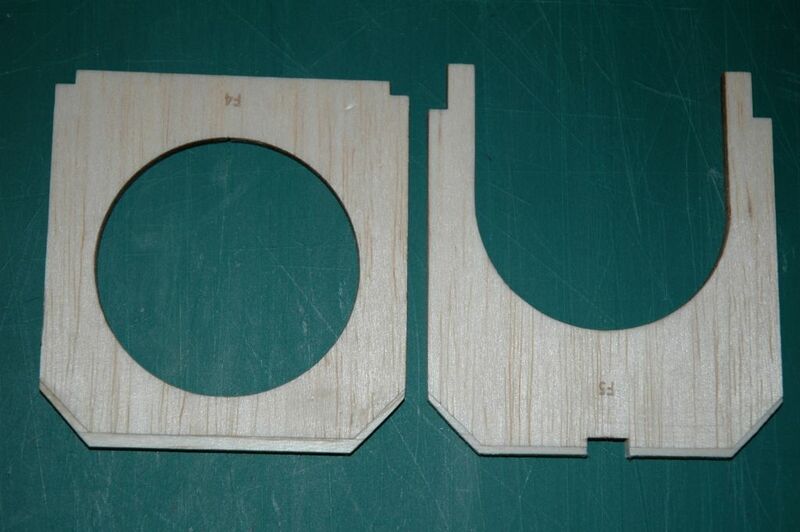 I went for the full depth 'skin piercing' 1/16" ply dihedral brace, rather than using the narrow one supplied with the laser cut parts. My servo box is sized to fit a single HS-225MG, but I made it slightly wider so that it will also accommodate two 13mm micro servos if I choose to change to a two-servo setup in the future. I added some additional gussets at the centre TE, cut from TE section, to spread the load from the wing bolt into the structure. 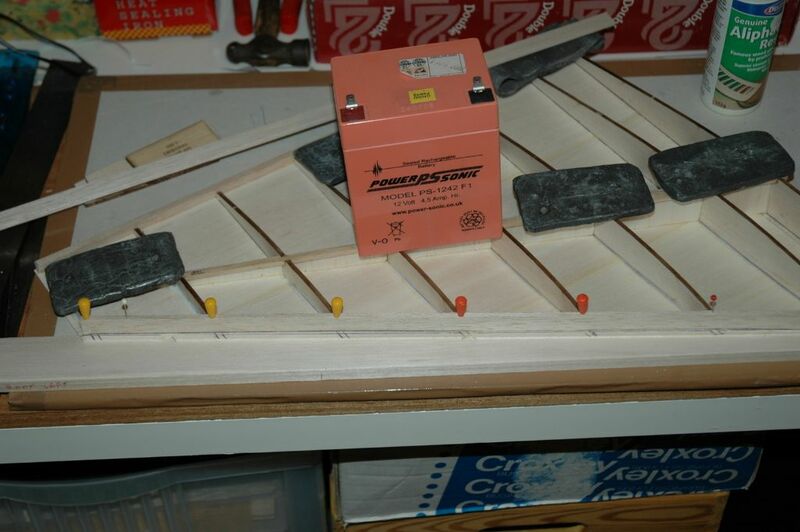 I might then reduce the thickness of the Lite-ply load spreader fitted on the lower surface. 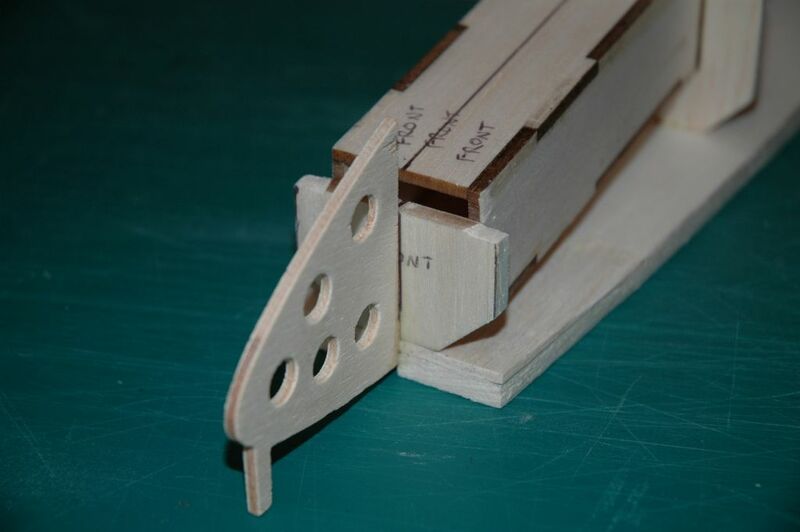 Here's the dihedral brace dry-fitted, protruding above the spars and gussets. The slot with the brace removed. 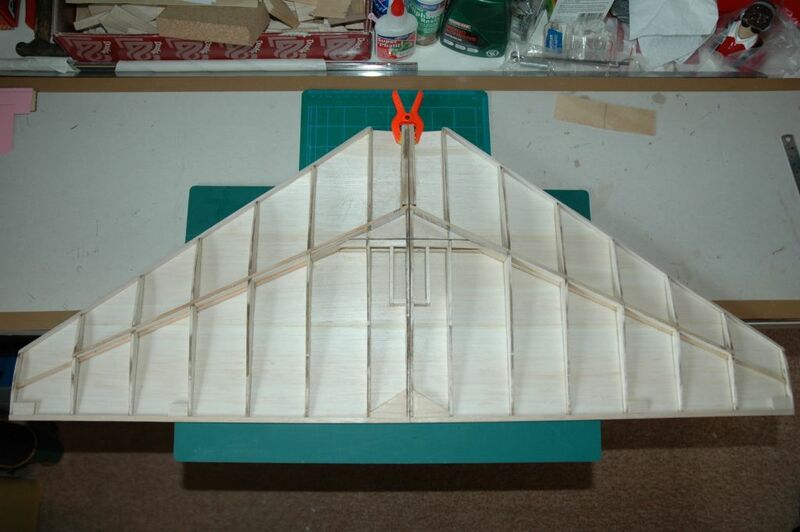 The final bare structure photo before adding the top wing skin. 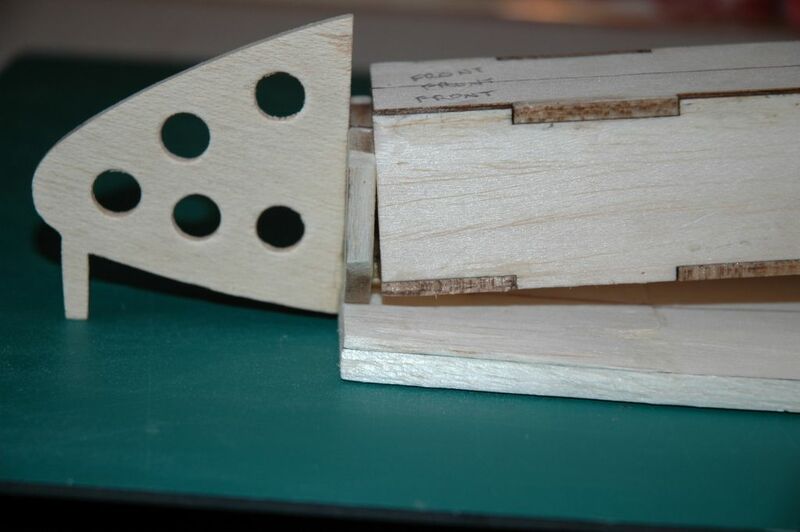 Two small blocks fitted to take the pin and leaf hinges for the ailerons. 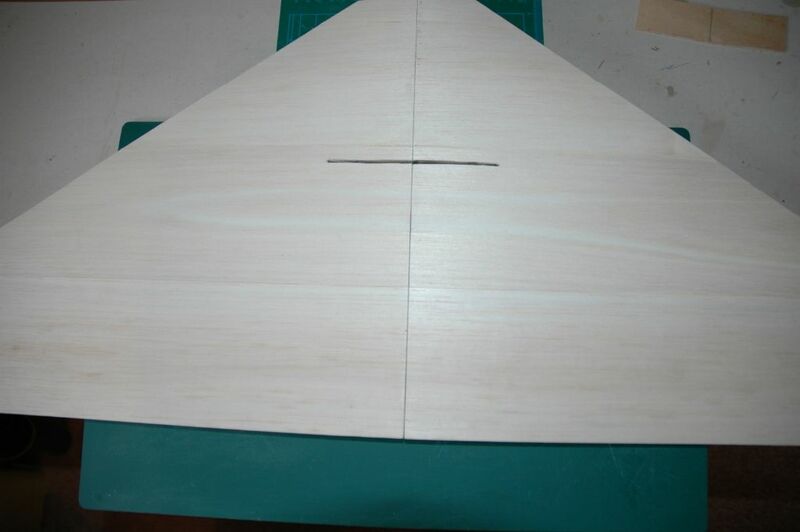 Finally, the slot in the lower wing skin for the dihedral brace to penetrate and bind to the wing skin when glued later. The top skins have been added uneventfully. I used Evo-Stik 'green' PVA, which has a slightly slower setting time than my Aliphatic, giving more time to spread the glue well across the ribs and spars before plonking the skin on top. The leading edge has now been added. NOTE: I ended up with a slight forward curvature in the sub-LE near the root end. I spent some time dressing it back to remove the curve, and as a result the LE strip needed to be 9/16" deep, rather than the 1/2" deep quoted on Phil's wood list. If you build straighter than me, you may not have this problem. Hence, I cut the LE from sheet rather than using the strip I bought. The LE is pinned for locating in place, then taped to pull it back against the sub-LE. 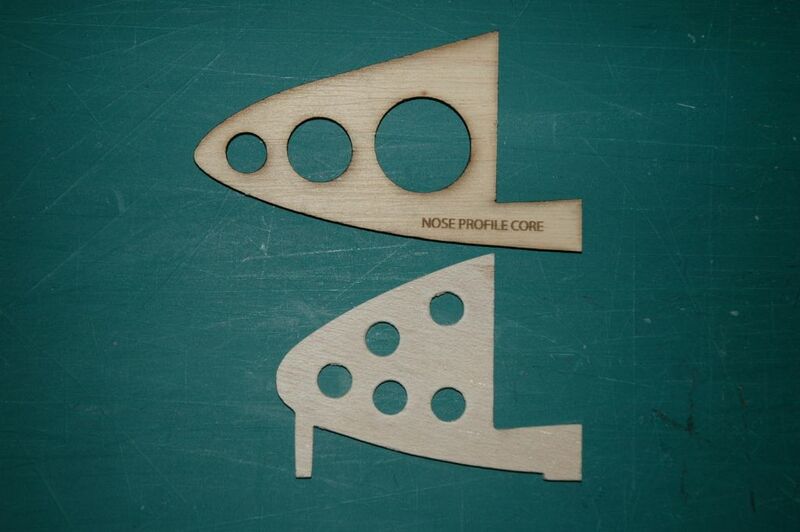 The nose former will be shortened and re-cut to the new profile shown below. 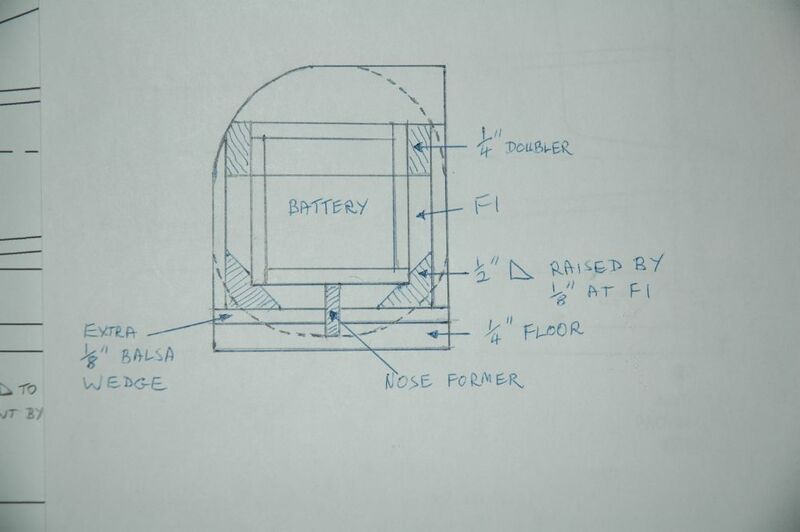 The top of the tab that supports the battery box is unchanged, but the lower edge is more curved. I may add a building tab to support the front at the right height during assembly, to be cut off later. The lower nose sheeting needs more curvature, but this will leave the sheet a little too thin for comfort. Hence, I shall raise the front of the 1/2" triangular sections by 1/8", with a sheet wedge that tapers down to nothing at 2.5" from F1. This needs a cut in the triangluar section at the end of the wedge, to change direction. 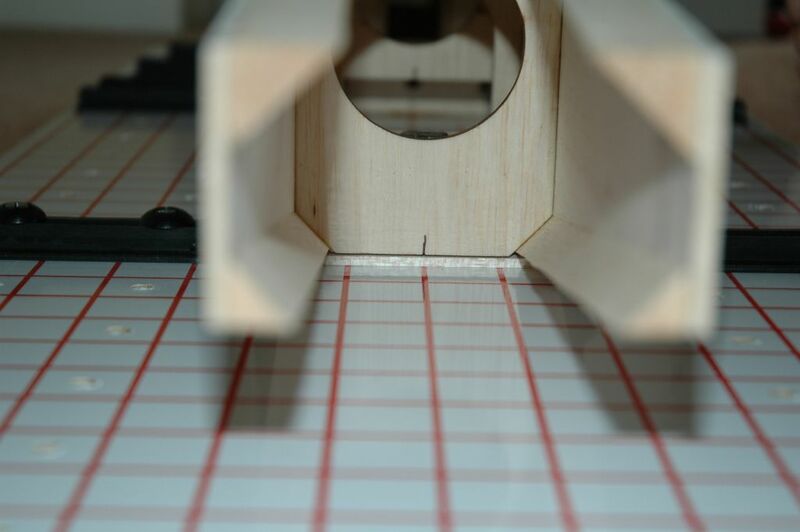 The bottom 1/4" sheet can still lie flat on the board during construction, and will be planed down later. This revised F1 section below shows the changes more clearly. 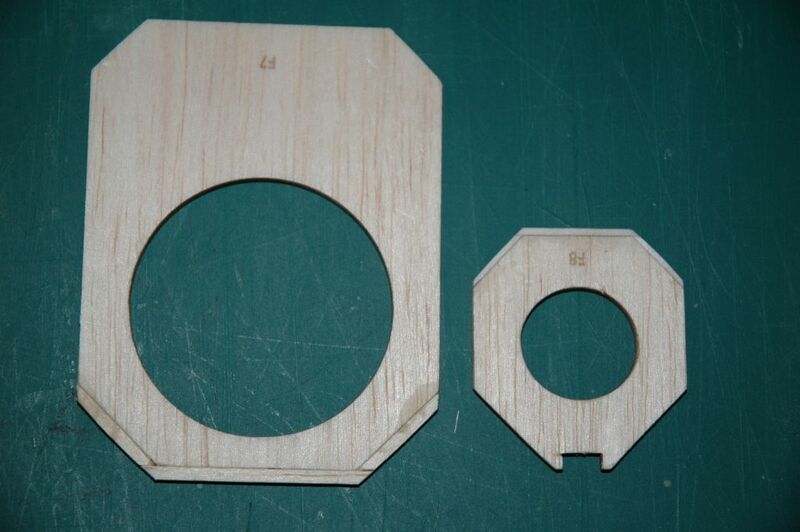 F1 will be reduced in height by 1/8" (chamfered) at the bottom to allow the extra 1/8" sheet wedge to be inserted. 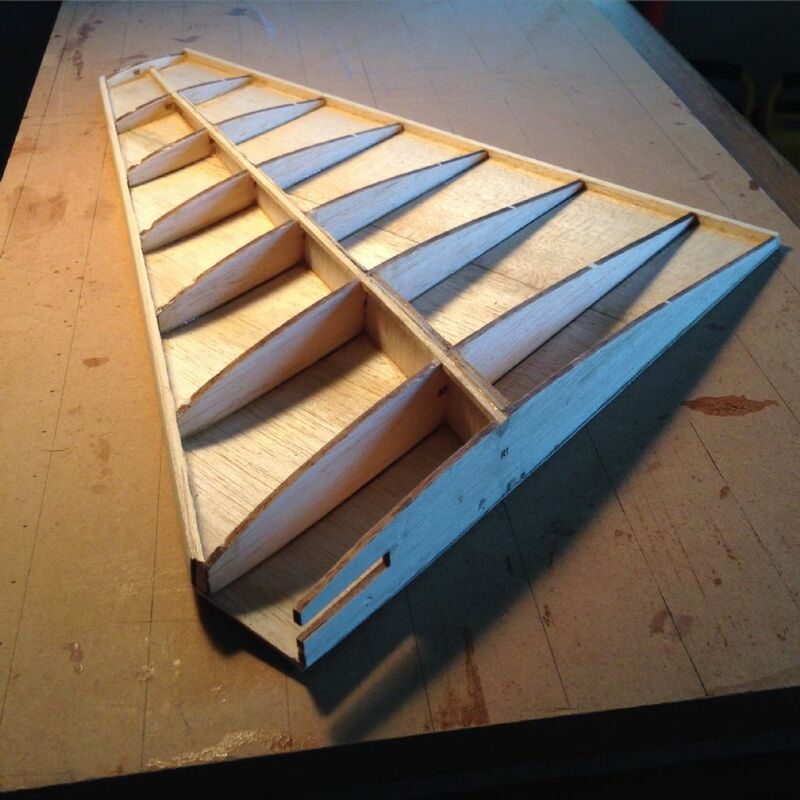 The raised trianglular sections will now clash with the lower corners of the front part of battery box, so I'll cut some small recesses into the trianglular to match. I deliberated whether to just risk keeping the nose design unchanged and just plane away, but I'll feel happier to have more wood to plane to shape at the front. I shall post a few pics when the glueing starts. (does gluing have an 'e' in it? I think one is British and one is European, but we won't go there!). 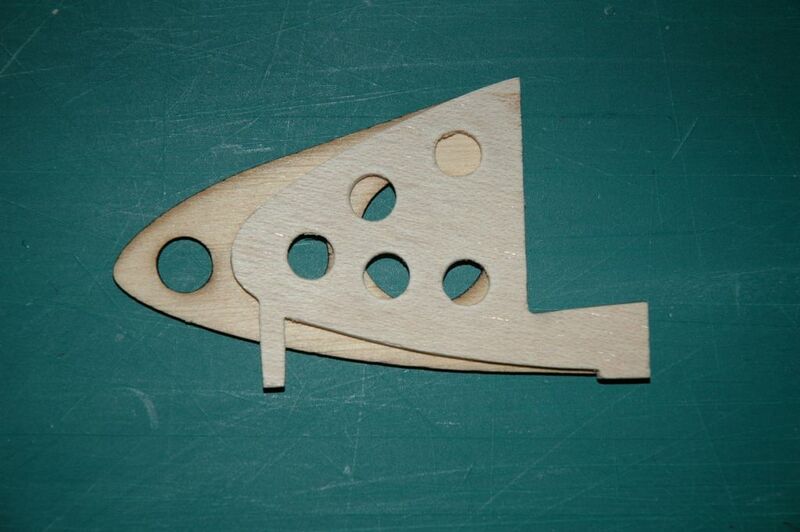 Assembly of the nose section followed the magazine instructions with no probelms. 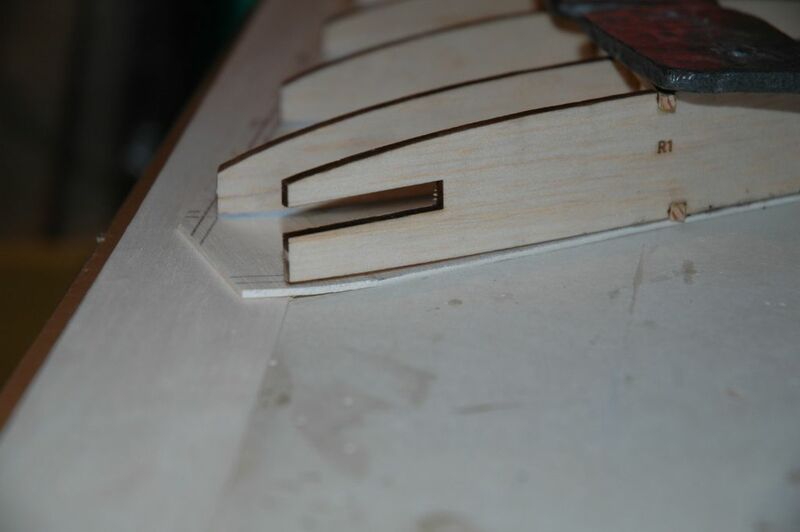 I was glad to have the jigging tabs on the nose profile, which made easy work of aligning it. As mentioned on the main A4 Building Tips thread, a combination of circumstances led to most of my formers being undersize to mate accurately with the fuselage sides. This method only works if the 1/4" lower nose sheeting is first cut to size, slightly smaller than the width of the fuselage. 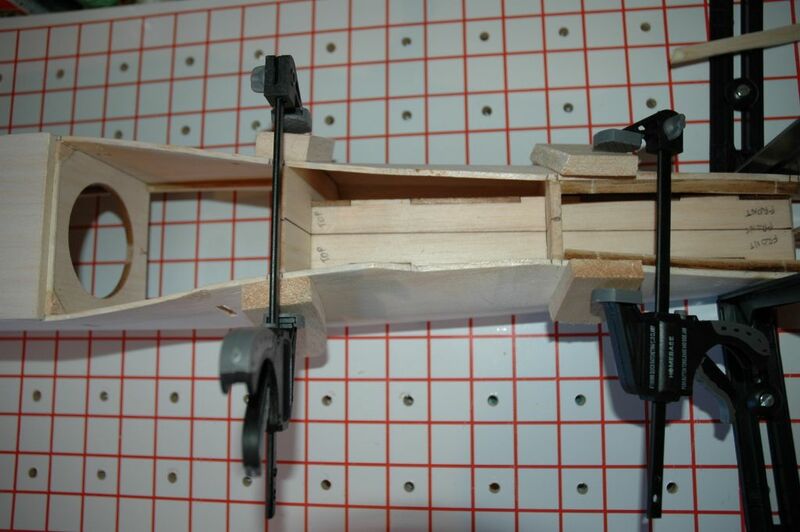 Without this, the jig uprights would not touch the sides. 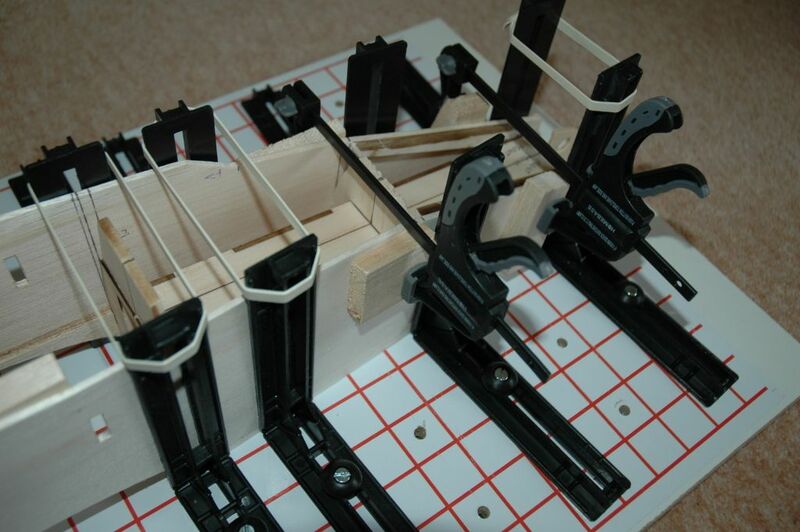 To pull the sides in a litltle at the top, I used these dinky little 6" bar clamps (£7.49 a pair from Homebase). 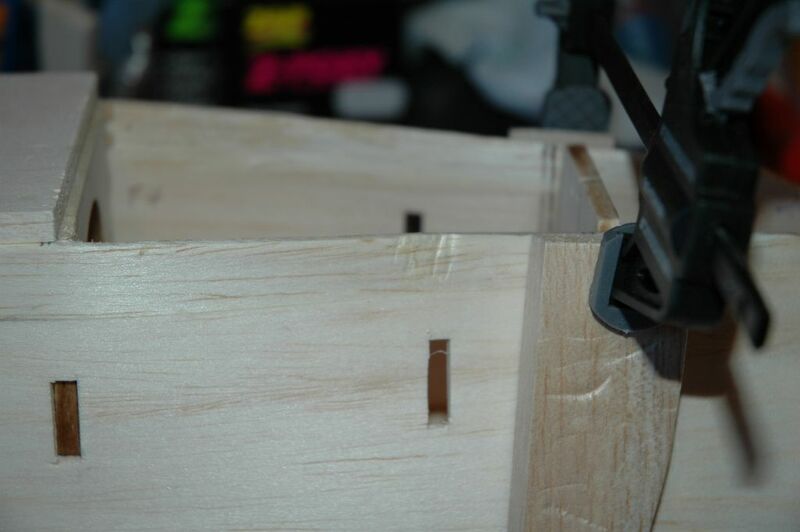 Only clamped enough to provide a slight inward pressure, so that they don't pull the lower edges apart. Now, I'm off to read up the notes on Ammonia treatment for the next stages! "...I'm puzzling how to shape and attach the sub-LE 1/8" sheet..."
After successfully attaching the underskin to the forward section of the ribs and spar, next, with Super 'Phatic well in hand, simply space-out altogether, send your mind to la-la land, and just glue the wrong part there altogether: attach the LE, NOT the sub-LE. After it all dried quite nicely, and looked so fit and pretty and nice, I then and only then awoke to my mental-prang. So I next had the delightful opportunity to either cut off / saw off / hack off / dynamite off (etc.) the damn thing, or leave it there and plane it, sand it, sandblast it down to spec for a GLORIOUS Sub-LE !!! I chose the latter; Lord only knows what next savage error I shall inflict, but trust, it WILL happen! HAHA! Whilst sanding it I shall we say "lightly caressed" the tops of the ribs, because naturally I was not going to take TOO much care with this delicate process... ... actually, the damage to those ribs ain't nearly as bad as it looks, it's actually just a bit of the "char" coming off. I'll need to sand the thing down a bit more when the time comes to attach the LE, but otherwise things are looking SYSTEMS GO! for more misadventurings in SkyhawkVille. And meanwhile yours is looking GREAT! p.s. My wife says your Singapore Black Lions scheme is the nicest. The rest of us are chopped liver. I had a chuckle at your post - not your misfortune, but your comedic way of presenting it. I have to say that if you hadn't let on, no-one would have noticed. The end result is perfectly acceptable. I'm sure you know, but a good way to reduce the risk of rib damage when sanding the sub-LE is to lay a length of masking tape along the ribs from root to tip, just behind the LE, then plane/sand away until the top of the tape starts to get scuffed. Then peel the tape away and finish off very slowly to achieve the perfect finish - at least that's what I'm told! I hope my Black Knights scheme will look as good as the full-size. I do like camouflage schemes as well, but I thought this one might be quicker, since I'm always short of time. I'm following your thread to see how you progress with your nose modifications, which are somewhat more extensive than mine. Keep up the good work. Ammonia a poor little learner! Donning full PPE and looking like a post-apocalypse survivor, I ventured into the garden to find an isolated corner to implement the ammonia moment. I liberally dosed the fuselage ahead of F4, and the nose doublers, with several coats of the ponging stuff, waited for 5 minutes and then tried to coax the sides into place. Whilst they did bend a little more easily than when dry, I managed to crack the top part of one side behind F3. Reading the magazine article again, it clearly says to wait until the ammonia is dry before bending the wood. Is that what I should have done?? I thought it was more likely to bend whilst wet. Maybe I was in too much of a rush. With the side now dry, its was easy to dribble some glue down between the sides and the formers to lock the sides into place. Waist reduction with a vengeance! I notice that the nose now increases in width again between F2 and F1. I'm not sure if this is correct, or whether further ammonia surgery is needed.